Visual Studio Mac have all functionality of XS. So why not install templates for VS Mac? The VsforMac API changed significantly, so the existing Addin will not function correctly. Refresh and then look in "IDE Extensions". You should see "MonoDevelop.MonoGame.Templates" v0.1. Note this is very early in development and will have bugs and issues. Much appreciated. However, when installing it, I run into the following issue. Any idea on how to solve this? Hate to bug you, but I still have the same issue. Did you republish? Not sure if you want bug reports here, but I upgraded to the Visual Studio alpha in order to test it. Installed fine, but when I try to create a new project, it seems to only create parts of it. I pretty much just get a solution file and a project file. Also, the dialog never closes after having clicked create. I am new here and managed to create a Monogame solution/project in Visual Studio for Mac by following the instructions above, but I'm basically on the same page as @Fletch. According to a tutorial on this site, it should have quite a few other files and should be able to run. That is not the case, unfortunately. So what are my options? Should I wait for some kind member of this community (like @dellis1972) to provide a solution? HI @Fletch, did you found any workaround for this ? Not really. 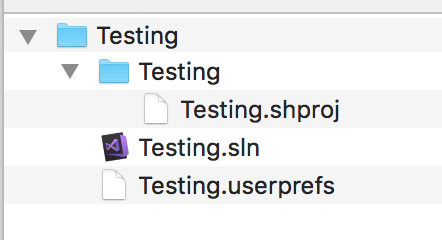 I installed the latest Xamarin Studio on another mac, created the project from there and then copied that over to my Mac with Visual Studio. So far so good. Yupp I am also able to run existing application. Actualy I am in learning phase for mono game & thought of starting from zero. It's just the template. If you can get it in another way or create a project and add the dependencies yourself it's fine. A future version of MonoGame will have a standalone project generator. I updated the Template creator for VSForMac 7.0.1. 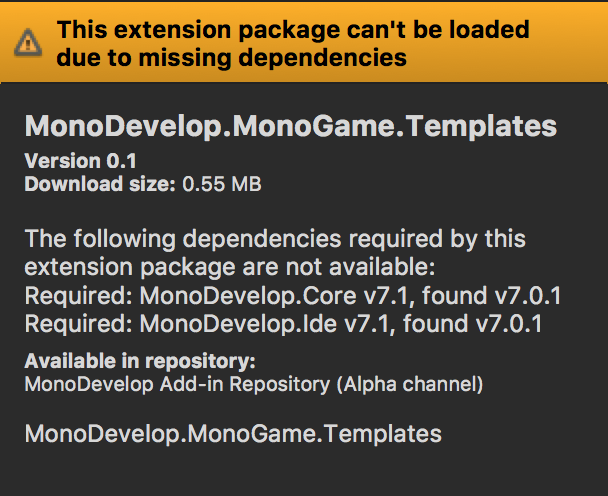 You should see "MonoDevelop.MonoGame.Templates" v0.3 now in the Gallery. It should fix the issue reported earlier, the addin was missing some template files. But it will still have bugs no doubt since its still a work in progress. I really need to commit the code so others can contribute. Anyone having luck with the new template for 7.0.1? I just installed VSForMac and MonoGame but the project creation doesn't finish (dialog just hangs). Same thing as joshr here. When I create a new DesktopGL project, the dialog box doesn't close itself and when I click Cancel, no files are generated in the solution. ok the latest version 0.6 , desktop GL should generate. But it does expect to be using the latest develop I think. since it looks for the .dylib/.so files in the $(MonoGameInstallDirectory).